Insulin injections are required when the body produces little or no insulin, as with type 1 diabetes. They are also required for some people with type 2 diabetes when diabetes tablets, together with healthy eating and regular physical activity, are not enough to control blood glucose levels. Insulin is a hormone made by special cells, called beta cells, in the pancreas. When we eat, insulin is released into the blood stream where it helps to move glucose from the food we have eaten into cells to be used as energy. Insulin also helps store excess glucose in the liver. Why must it be injected? While ways of taking insulin by mouth or as a nasal spray are being developed, they are yet to become readily available. Insulin cannot be given in tablet form as the stomach would digest it, just as it digests food. What if I have to go on to insulin? For people with type 2 diabetes, starting on insulin can be a difficult and frightening decision to make. However, the many injection devices and tiny needles available today make injecting insulin much easier than most people imagine. In fact many say that they can feel the finger prick for monitoring blood glucose more than they can feel the needle used to inject insulin. When starting on insulin, your doctor and diabetes educator will help you adjust to the new routine. You may find that even with their help, it may take a while to find exactly the right dose to reduce your blood glucose to acceptable levels and to suit your particular lifestyle. There are 5 types of insulin ranging from short to long acting as insulin is classified according to how long it works in the body. Some insulins are clear in appearance, others cloudy. Everyone is different and will respond differently to the insulin they take. Therefore, many people need varying amounts of both a short and longer acting insulin. Rapid acting insulins are clear in appearance. They are very fast acting, starting to work from 1 to 20 minutes, peaking approximately 1 hour later and lasting from 3 to 5 hours. When using these insulins, it is important to eat immediately after injecting. Short acting insulins are clear in appearance. They begin to lower blood glucose levels within half an hour so you need to have your injection half an hour before eating. These have a peak effect at 2 to 4 hours and last for 6 to 8 hours. Intermediate acting insulins are cloudy in appearance. They have either protamine or zinc added to delay their action. These insulins begin to work about 1 ½ hours after injecting, peaking at 4 to 12 hours and lasting for 16 to 24 hours. Before injecting this type of insulin, make sure you check the leaflet inside the pack for instructions on how to prepare the insulin. Mixed insulins are cloudy in appearance. They contain pre-mixed combinations of either a rapid onset fast acting or a short acting insulin and intermediate acting insulin, making it easier by giving 2 types of insulin in 1 injection. If the insulin is 30/70 then it contains 30 per cent quick acting and 70 per cent intermediate acting insulin. If the insulin is 50/50, then it is 50 per cent of each. Humalog®Mix 25 (25 per cent insulin lispro, 75 per cent insulin lispro protamine suspension). Insulin glargine (Lantus®) is a long acting insulin which is usually injected once a day but can be twice a day. Glargine must not be mixed with any other insulin in a syringe. Glargine pens are available for use with glargine insulin cartridges. Insulin detemir (Levemir®) is also a long acting insulin which can be injected once or twice a day. Detemir is available in a disposable pen called a FlexPen® as well as in a 3mL cartridge for use with a durable pen device. Both glargine and detemir last up to 24 hours. Both are used to provide background or basal insulin and both need to be supplemented with injections of a rapid or very fast onset insulin at meal time. Detemir (for type 1 diabetes only) and glargine are listed on the PBS. Insulin syringes are to be used with insulin vials (10 ml). Syringes are manufactured in 30 unit (0.3 ml), 50 unit (0.5 ml) and 100 unit (1.0 ml) measures. The size of the syringe will depend on the insulin dose. It is easier to measure a 10 unit dose in a 30 unit syringe and 55 units in a 100 unit syringe. It is best to use each syringe once only. Needles on the syringes are available in different lengths ranging from 8mm to 13mm.Your doctor or diabetes educator will help you decide which syringe is right for you. Syringes are free for people registered with the National Diabetes Services Scheme (NDSS) (external site). Contact Diabetes WA (external site) on 1300 136 588. Devices are available in different shapes and sizes. An insulin cartridge (3ml, containing 300 units of insulin) fits into the device. When finished, a new cartridge is inserted. Some pen devices, however, are pre-filled with insulin and the whole device is disposable. Your doctor or diabetes educator will advise the one that’s right for your needs and lifestyle. Many people find pen devices easier and more convenient to use than syringes. Those who have difficulties with their sight or have problems with arthritis may find the InnoLet® pre-filled device or similar easy to use. Discuss this with your doctor or diabetes educator. It is recommended that the needle be changed with each injection. Needles vary in length – 5mm, 6mm, 8mm or 12mm. They also vary in thickness (or gauge) – 28G, 29G, 30G or 31G. The higher the number the finer the needle. The insulin pump is a small programmable device (about the size of a pager) that holds a reservoir of insulin. The pump is programmed to deliver insulin into the body through thin plastic tubing known as the infusion set or giving set. The pump is worn outside the body, in a pouch or on your belt. The infusion set has a fine needle or flexible cannula that is inserted just below the skin (usually on the abdomen) where it stays in place for 2 to 3 days. Only rapid acting insulins are used in the pump. Whenever food is eaten the pump is programmed to deliver a surge of insulin into the body similar to the way the pancreas does in people without diabetes. Between meals a small and steady rate of insulin is delivered. The insulin pump is not suitable for everyone. So, if you’re considering using one, you must discuss it first with your diabetes health care team. Insulin is injected through the skin into the fatty tissue known as the subcutaneous layer. You do not give it into muscle or directly into the blood. Absorption of insulin varies depending on the part of the body into which you inject. The tummy (abdomen) absorbs insulin the fastest and is the site used by most people. 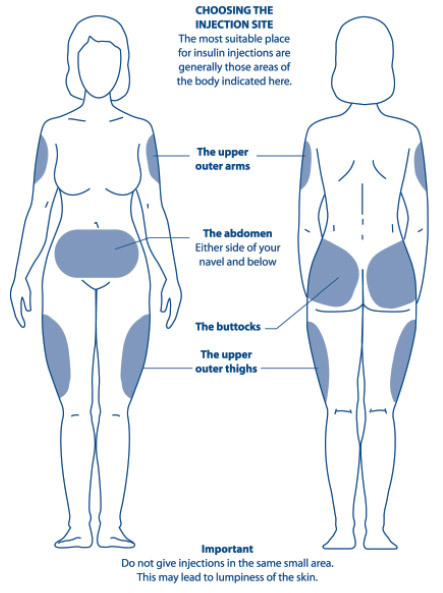 The upper arms, buttocks and thighs are also used by some people. While it is essential to give each injection in a slightly different spot within the one site (such as the tummy), it is not advisable to change sites without first discussing it with your doctor or diabetes educator. What affects the way insulin is absorbed? injecting into muscle (the deeper the injection into muscle, the faster the insulin will be absorbed). Variation in insulin absorption (either accelerated or delayed) can cause fluctuations in blood glucose levels. cold insulin (for example injecting insulin immediately after taking it from the fridge). Keep your unopened insulin vials or pen cartridges on their side in the fridge. Do not allow your insulin to freeze. Once opened, insulin may be kept at room temperature (less than 30° C) for 1 month and then thrown away. Insulin can be safely carried in your handbag or pocket. Insulin may be damaged by extreme temperatures. It must not be left where temperatures are over 30° C (remember it can get this hot in the glove box of your car) or in direct sunlight. the vial has been open for longer than 1 month. What's the best way to dispose of used syringes? Used syringes, pen needles and lancets must be disposed of in an Australian Safety Standards approved sharps container which is puncture-proof and has a secure lid. These are usually yellow in colour and are available through pharmacies and Diabetes WA (external site). Contact Diabetes WA (external site) or your local government for procedures to dispose of sharps containers. Many countries need insulin. If you have spare in-date insulin, please donate to Diabetes WA (external site) or send directly to Insulin for Life (external site). Insulin is a hormone made by special cells in the pancreas. Absorption of insulin varies depending on the part of the body into which you inject.